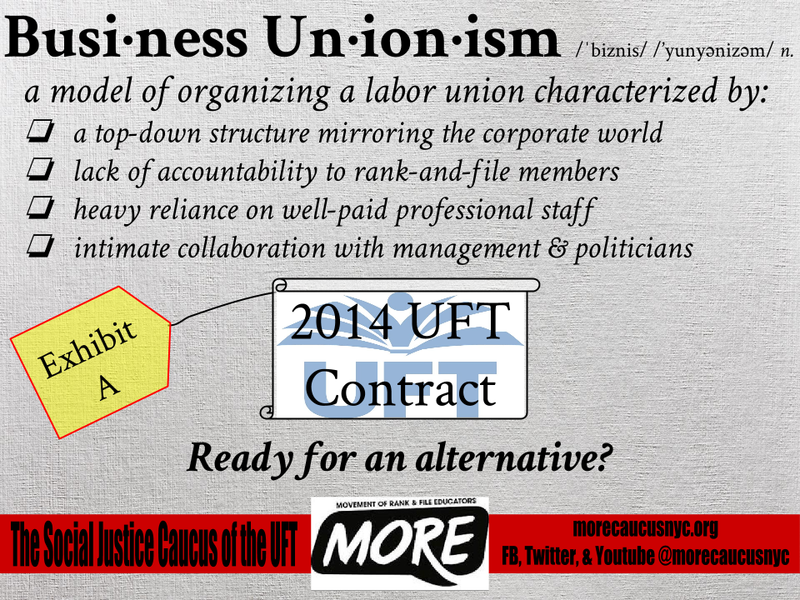 Because the 2005 contract was almost ten years ago, several people in the UFT have spoken to me of its shortcomings. I'm surprised they do that, because when it came up every single UFT rep said it scraped the skies with its unrivaled wonderfulness. We now know that it was a huge mistake. On the other hand, I knew it immediately upon seeing it. I had just started this blog, with the specific intent of trying to counter the crap I was always reading in the tabloids. I had gotten a few columns in NY Teacher and was interested in supporting the union. I knew almost nothing about union politics. When Edwize appeared, I was excited. I thought this was a great step for the union, and I was getting ready to dump this blog and start writing for Edwize instead. The 05 contract changed everything. It turned out neither Edwize nor NY Teacher wanted to hear how awful the new contract was. The ATR was just a temporary problem. This was not the first time it had happened. No one in leadership seemed to know that Joel Klein would continue to hire new teachers even as our colleagues lingered as longtime subs. No one in leadership seemed to understand that a raise was doing the same job for more money, or that if you worked extra hours, did extra tasks and received extra money, that this was not a raise. The thing that's problematic about our leadership is this--they never make mistakes. While they may admit to doing something wrong ten years ago, that has no bearing on the present. So what if they negotiated a junk science law, the beauty of which was that we could negotiate a good portion of the junk science? So what if, when that didn't pan out, we left it in the hands of fanatical ideologue John King? It was a great victory when we fought Mayor Bloomberg and made all Danielson domains were part of observations. It was also a great victory when we changed that and made only 8 domains part. It was a great victory when we gave teachers the opportunity to use artifacts in evaluation. It was also a great victory when we removed artifacts from evaluation. It was a brilliant tactic to ensure teachers paid nothing into their health care. It was also a brilliant tactic to subject it to binding arbitration and perhaps have teachers pay into health care. It's a great victory that ATR teachers will now get a one-day 3020a hearing if they get accused of shouting in the hall by two different principals. According to the UFT President, people acquitted at 3020a hearings often complain of how long they take. What a nuisance it must be to call witnesses so you can't be fired for no reason! They were wrong in the past, and they're wrong now. What we really need is a leadership that listens to rank and file. The Unity loyalty oath ensures that all leadership hears is the voice of people looking for patronage at the expense of the truth. You can't run a union while sitting under a cone of silence. It's time to vote for people who are not afraid to challenge the status quo. We can't do that for a while. What we can do now is vote no to a contract that shatters due process for working teachers. We are union. We can't have one process for us, and another for ATR teachers. That's unconscionable. I can't believe our leadership doesn't see that. Of course, I'm not Unity, so they don't consult me. If I were Unity, I wouldn't be allowed to speak freely.